Your power as an authentic teacher of yoga comes from a broad and consistently applied personal experience of yoga-sadhana under expert guidance. 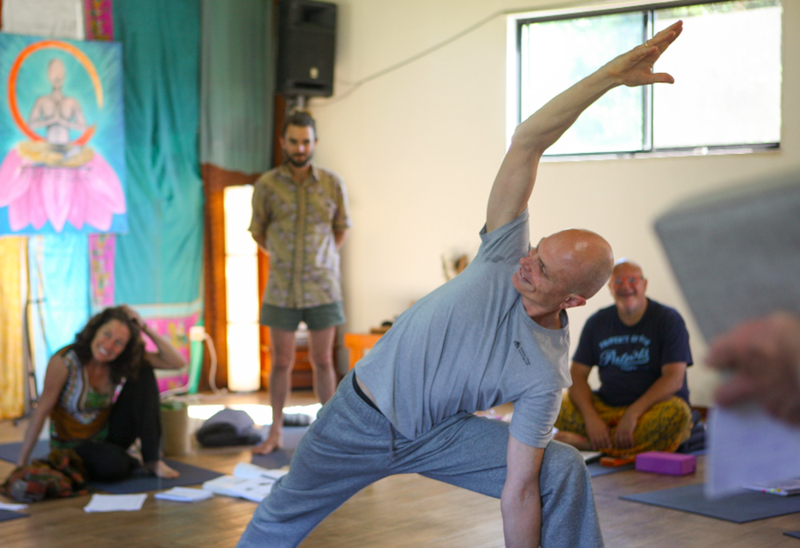 Welcome to the next level of Krishna Village yoga teacher training! This course is Yoga Alliance accredited! Find your yogi tribe and nourish your soul, living in a fascinating, vibrant community of about 75 yogis, travellers and spiritual seekers. Experience the essence of yoga with a traditionally integrated approach to postures, pranayama, meditation, ayurveda, philosophy, cleansing kriyas, kirtan, anatomy, physiology, nutrition and mindfulness - the whole is the goal! Practice and hone your craft: teach ongoing classes and receive quintessential guidance and in depth feedback from our team of internationally experienced senior yoga teacher trainers. To see if this experience is for you, read our FAQ for YTT Level 2 and have a look at our Code of Conduct. If you are dealing with any physical or mental health issues, please also check our 'Are you ready' page to make sure this is a suitable course for you. ... teach classes and receive valuable feedback from senior teachers and mentors. ... need to have a basic understanding of the practice of kirtan (such as is achieved in our Level 1 course). A morning ritual of Ayurvedic and Yogic Kriyas (cleansing practices) along with Pranayama and Meditation, which will progressively increase in depth throughout the course. 2 hour Yoga Workshops with senior teachers each week, followed by a 3 hour unpack of the workshop so that you will understand and be able to replicate similar workshops. Topics will include: Advanced Sequencing, Yin Yoga, Therapy Yoga, How to weave Philosophy into your class, Partner Yoga and Massage, the relationship between Chakras and Gunas, and Advanced Posture workshops such as teaching Forearm Balances. 'Art of Presentation' workshops, to teach you how to deliver a 1 hour presentation of your choice. A deeper immersion into the Bhagavad Gita and Yoga Sutras, as well as other yogic texts (will require reading prior to the course). More Anatomy and Physiology with a focus on breath and the Parasympathetic Nervous System. Classes on Ayurvedic lifestyle, incorporating diet, fasting and detoxification. The Krishna Village can host up to 85 people in a combination of rooms, dorms and camping spots. There are usually around 30 full time volunteers who work in our organic gardens and maintain the grounds, 15-25 retreat guests or Karma Yogis and up to 20 yoga teacher trainees. The Krishna Village has 9 double rooms (1 big bed), 5 twin share rooms bunk bed) and 12 single rooms. They are all set in former shipping containers that have been renovated and turned into simple but comfortable accommodation. All Twin rooms are equipped with bunk beds, bedding is being provided. Set among beautiful mango and lychee trees in our Eastern garden, our camp ground can host up to 20 tents and 5 camper vans. The van area is equipped with electricity. The amenities block is only 50m away. The early bird rate ends on 28 January 2019. Bonus discount for Krishna Village YTT Level 1 students: Book your Level 2 training before the end of your Level 1 course and get an extra 10% discount! If you haven’t attended Krishna Village’s Level 1 teacher training, please contact us to apply. We will then get in touch asap to confirm your attendance.